Doug Porter and Frank Gormlie accept OBMA's award at their annual dinner. Oct. 22, 2009. Photo: Jim Grant. OCEAN BEACH, CA. 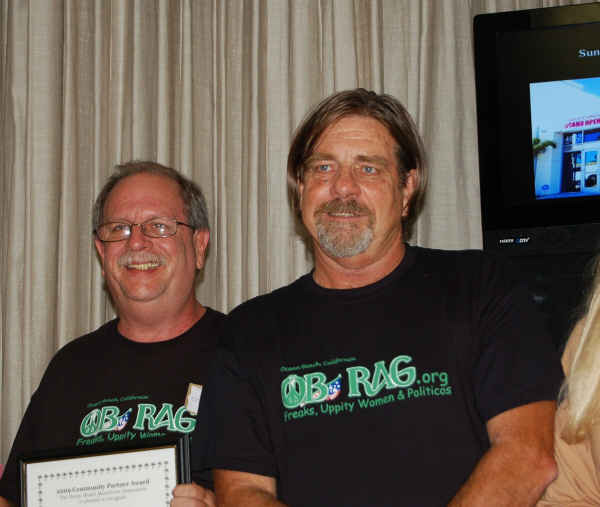 Last night 10/22/09 at the Masonic Temple, the OB Rag received a special award from the Ocean Beach Mainstreet Association for our coverage of OB’s annual Street Fair held last June. OBMA awarded the blog a 2009 Community Partner Award “For outstanding coverage of the 30th Annual Street Fair & Chili Cook-Off Festival”. Doug Porter and Frank Gormlie accepted the plaque on behalf of the website. Others from OB Rag attending were Lane Tobias and Gary Gilmore – who is also on the OBMA Board of Directors. 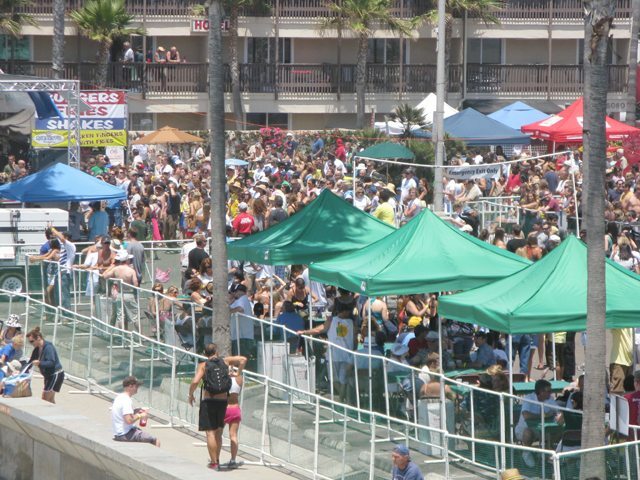 It is true that the OB Rag’s coverage of the Street Fair was awesome! … and you guys wore matching uniforms, how nice. Too bad we couldn’t get a picture of Doug & Frank with the Mayor, Kevin Faulconer & Christine Kehoe. THAT would have been worth framing. Hey, Chris and I are old pals. Before she was elected to the City Council, she was my project manager for City Heights programs. The Mayor loves the OB Rag as he admitted that the “save the OB Library campaign” was a model for the city last year. And Kevin said he would let me sit in his chair during council meetings. man, those t-shirts are handsome!! I can’t believe the 60 shirts are not flying off the shelves!! . . .
Dickie, actually we’ve sold 20 out of 60 so far. I was hoping that you’d stop by the post about Ernie McCray’s B-ball record. Scroll down. You two make a lovely couple! Go, go Prop 8! I am not dissing the OB Local Businesses….you should know better than that with me. I am commenting on the OBMA and their historic lack of support, even condemnation, of campaigns and activities of prior OB Rag and other activist-type folks. Geez Louise….Is the fog really that heavy? …perhaps I’m overreacting, maybe a tad sensitive as my integrity and honesty and citizen journalist abilities and even ability to comment about OB after living in OB for 30 of my last 40 years have been questioned by public and private comments and emails of late….